The state legislature has passed one of two measures needed to require Missouri voters to show a Photo ID to vote. Under the measure, a driver’s license and supporting documentation, like a birth certificate would be paid for by the state. Those without photo ID could still vote if they sign a form and show a utility bill or paycheck. The voter could also cast a provisional ballot, which would count if the voter could later prove their identity. The estimated cost of paying for IDs and supporting documents is as much as $10.5 million for the first year. Representative Shamed Dogan (R-St. Louis) calls it the most generous photo ID bill that the U.S. has seen. 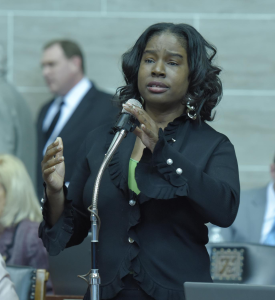 Representative Stacey Newman (D-St. Louis) says those without a photo ID would be considered second class citizens. Representative Karla May (D-St. Louis) calls the bill “crap”. Dogan and Representative Justin Alferman (R-Hermann) say no one will have their voting rights taken away. “Do you see anything in this bill that says that IDs will be checked for people of certain races but they won’t be checked for people of other races,” said Dogan. “It’s a thirteen page bill, gentleman, and I can’t find that anywhere in the bill,” said Alferman. Representative Kim Gardner (D-St. Louis) says there’s no compromise on voting rights. “We can’t even put background checks for guns because that’s a second amendment fundamental right, but we can put all these different hurdles for voting rights because that’s somehow different. I say protect all constitutional rights equally,” said Gardner. 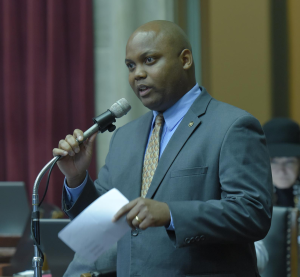 A companion bill awaiting a final vote by the Senate and House is a proposed change to the constitution that would ask Missouri voters if a photo ID should be required to cast a ballot.